The rediscovery of the works of the great Danish organist and composer Dietrich Buxtehude occurred as a byproduct of the Bach revival that began in the nineteenth century. At the age of twenty, Bach made his legendary 200-plus mile journey on foot to meet and hear Buxtehude. This evident admiration inspired the Bach revivalists to investigate Buxtehude's organ works, but much of his other music remains almost unknown, although the chamber and clavier music has at last begun to circulate more widely in recent years. 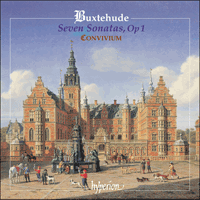 Of Buxtehude's twenty-one extant chamber works, seven are presented on this disc. The scoring for violin, viola da gamba and harpsichord identifies these works as belonging to the north German chamber tradition. In Italy, two violins and continuo was the norm for trio writing, but German composers often preferred the contrast of timbre and range that violin and gamba provided. These attractive works were the avant-garde of their day, written in the new stylus phantasticus with emphasis on expression, virtuosity and excitement, incorporating otherwise unusual progressions, hidden ornaments, ingenious turns and embellishments within the music. Performed with Convivium’s customarily high standard of grace and expertise, for which they are so renowned. The rediscovery of the works of the great Danish organist and composer Dieterich Buxtehude occurred as a by-product of the Bach revival that began in the nineteenth century. At the age of twenty, Bach made his legendary 200-plus mile journey on foot to hear and meet Buxtehude in Lübeck, being castigated by his Arnstadt employers for returning three months late; scholars examining and editing Bach’s works reasoned that Buxtehude’s music too must be worth reviving, if Bach admired it so. Monographs by André Pirro (1913) and Carl Stahl (1937) followed Spitta’s edition of the organ works (1875/6). Yet the composer’s other music has had to wait until the last few decades for revival, whether as editions, subjects for scholarly enquiry or recordings. While many of the hundred-plus cantatas remain almost unknown, the chamber and clavier music has at last begun to circulate more widely in recent years; the Opp 1 and 2 sonatas have in fact been available in a modern edition for many years (Denkmäler deutscher Tonkunst, 1903, later superseded by volume XIV of the collected edition, 1994). Buxtehude’s date and place of birth have not been recorded, but it is known that his father Johannes was organist of the St Maria Kyrka, Helsingborg, Denmark, in 1641, and Dieterich was probably born there in about 1637. By the mid-1650s son had succeeded father in that post, and the young Dieterich moved successively to organist’s jobs in Elsinore (1660) and Lübeck (1668). This latter post, at the Marienkirche, had been occupied by the eminent Franz Tunder. Buxtehude was not the first-choice candidate for this important job, and married his predecessor’s daughter Anna Margarethe some ten days after his appointment (evidently a condition of the role, and one which persisted: both Handel and Mattheson declined the Marienkirche post – and hand of Buxtehude’s 28-year old daughter – when they visited Lübeck to meet the composer in 1703). Buxtehude died in 1707, and was succeeded by his assistant (and posthumous son-in-law) Johann Christian Schieferdecker. He was accorded a high reputation in his day, numbering among his friends, pupils or admirers Reincken, Theile, Bruhns and Pachelbel. Bach’s obituary claims Buxtehude as one of his models in organ playing, and the influence of the older man is often apparent in Bach’s early organ works. Buxtehude’s twenty-one extant chamber works fall neatly into three groups of seven: the set of sonatas Op 1 (c1694), a further set Op 2 (1696), and others found only in manuscript, principally the Düben collection now at Uppsala University in Sweden. A further collection was apparently advertised in 1684, but either never appeared or has been lost – some of the manuscript sonatas may be survivals from this. Both published sets are scored for violin, viola da gamba and harpsichord, while the remainder are for more miscellaneous forces. The Op 1 works, VII Suonate á doi, Violino & Violadagamba, con Cembalo, di Dieterico Buxtehude, Organista della Chiesa della Beat. Virg. N.S. in Lubeca, Opera Prima, were printed in Hamburg by Nicolaus Spiering, and dedicated to the mayor and senators of Lübeck; as it was listed in the Book Fair catalogues of 1694 it was very likely then newly published. However, some of these works at least may be older, and the Sonata in B flat BuxWV273, which exists in a manuscript from the 1680s, was heavily reworked and shortened to appear as Op 1 No 4. The scoring of these works for violin, viola da gamba and harpsichord (the latter specified as such, rather than by the vaguer term continuo) identifies these works as belonging to the north German chamber tradition. In Italy, two violins and continuo was the norm for trio writing, but German composers (Becker 1674, Erlebach 1694) often preferred the contrast of timbre and range that violin and gamba provided. In addition, the wide compass of the gamba enabled it to function both as a continuo instrument, doubling or elaborating the bass (see the Lento of BuxWV255), and as a solo instrument in the tenor range. The most free and unrestrained manner of composing, singing and playing that one can imagine … all kinds of otherwise unusual progressions, hidden ornaments, ingenious turns and embellishments are brought forth without actual observation of the measure or the key, regardless of what is placed on the page, without a formal theme or ostinato, without theme or subject that are worked out; now swift, now hesitating, now in one voice, now in many voices, now for a while behind the beat, without measure of sound, but not without the intent to please, to overtake and to astonish. Quoted in Kerala J Snyder: Dietrich Buxtehude: Organist in Lübeck (New York, 1987), p 250. One example of this freedom can be found in the ground bass that opens the B flat Sonata BuxWV255: the theme itself is (unusually) three-and-a-half bars long, and Buxtehude uses a three-note repeated figure in the violin at unexpected places to further confuse the stress pattern of the phrases. And falling chromatic passages, as in the Largo section of the A minor Sonata BuxWV254, seem to belong to the world of Passion settings rather than the chamber sonata. Here, Buxtehude takes contemporary German chamber music into new territory. The great majority of late-seventeenth century chamber publications group works by the half-dozen or dozen (collections by Buxtehude’s contemporaries Reincken, Krieger and Rosenmüller, for example), and it appears that the number seven may have had some special significance for the composer (a lost cycle of seven keyboard suites depicted each of the then-known planets, according to Mattheson). Be that as it may, Buxtehude evidently regarded the Opp 1 and 2 sets as two parts of a greater whole, as they together include works in nearly all the major and minor keys of F, G, A, B flat, C, D and E – a scale of seven notes, the hexachordum molle, plus one tone (F major appears twice, but F minor and B flat minor not at all, probably as they lie outside the tuning system then in use). Such sets, like those of Biber ‘for the altar as well as the court’, (Sonatae tam aris quam aulis servientes, 1676) could be used in both sacred and secular contexts; the early version of Op 1 No 4 in fact has the bass marked ‘organo’ rather than ‘cembalo’, suggesting church use. At this time in northern Europe, the expanding and increasingly musically educated middle class sometimes formed musical societies (like that of Matthias Weckmann in Hamburg), and publications of chamber music would have found a ready market there. Buxtehude’s use of the violin, only once exceeding third position, would have been within the grasp of many amateurs, except for those moments where real virtuosity is called for, such as in the D minor Sonata BuxWV257 (whether the Opp 1 and 2 publications sold well is open to question, as only two complete copies survive today). They might also have been heard at Buxtehude’s regular Abendmusik Sunday afternoon concerts in Lübeck; his colleagues at the Marienkirche in the early 1690s, Hans Iwe and Johann Philip Roth, played violin and viola da gamba, and some of these sonatas may have been written for Iwe, Roth and Buxtehude to play together. The first sonata begins with a rather Corellian gesture which develops into a dialogue between high and low voices. A minor-key Lento then leads into one of those running-semiquaver fugues that are so characteristic of Buxtehude (track 2). In the following Adagio and 6/8 Andante the viola da gamba parts company with the harpsichord to produce a true trio texture, with much use of broken chord figurations and offbeat entries. A concluding Presto follows the style of the first two fast movements, now with an emphasis on repeated-note semiquavers. The G major sonata prefaces a lively fugal Vivace with a brief Lento introduction; a further slow section leads into an Italianate 6/8 Allegro, this time contrasting broken-chord violin figuration with a descending chromatic bass line. After another Largo pause for breath, an Arioso with five variations follows, the figuration reminiscent of Buxtehude’s clavier variations. The third sonata introduces a new, minor key feeling of pathos to the set, with an extended Adagio succeeded by a semiquaver fugue and then a change of mood to a major key Lento. A Corellian Vivace is linked by a characteristically North German chromatic Largo to a final Presto, with a brief reprise of the previous section. The B flat sonata opens with a lively Vivace built on a ground bass; the violin dominates the opening section, with the viola da gamba only entering at bar 18, a playfully virtuosic dialogue ensuing for the next 90 bars. This runs into a meditative Lento, then a concerto-like Allegro, brought to a close by double-stopping in the violin. The fifth sonata in C opens with a fugal movement that again stresses repeated-note semiquaver figuration. The following section dispenses with the viola da gamba, which rejoins at the Largo, leading to a gigue-like Allegro (the numerous dynamic contrasts indicated by the composer), another freely modulating Adagio and a final extended Allegro. The D minor sonata prefaces a fugal Allegro with a brief Grave; this leads into a busy section marked ‘Con discretione’, which is interrupted by a five-bar Adagio. Two virtuoso fast movements follow, each separated by a slower section, which returns to round off the sonata. The final 6/8 fast movement begins Poco presto, and is then marked Poco adagio and Presto, indicating the flexibility of tempo Buxtehude expected. The seventh sonata is also a minor key work; this time there is no slow introduction, just a fugal Allegro, led (as always) by the violin. A sequence of slow and fast movements ensues, completing the sonata – and the opus – with a prestissimo gigue. La redécouverte des œuvres du grand organiste et compositeur danois Dieterich Buxtehude1 est une conséquence indirecte du renouveau Bach amorcé au XIXe siècle. À 20 ans, celui-ci entreprit un légendaire voyage à pied de plus de 300 kilomètres pour aller voir et entendre Buxtehude à Lübeck, s’attirant les foudres de ses employeurs d’Arnstadt lorsqu’il revint avec trois mois de retard ; les musicologues du XIXe siècle qui s’intéressèrent aux œuvres de Bach et les éditèrent en conclurent que la musique de Buxtehude méritait sans doute d’être exhumée à son tour si Bach l’admirait tant. Des monographies d’André Pirro (1913) et de Carl Stahl (1937) succédèrent à l’édition de l’œuvre d’orgue par Spitta (1875 – 1876). Mais c’est seulement depuis quelques décennies que l’on s’intéresse aux autres partitions du compositeur et qu’elles font l’objet d’éditions, de recherches musicologiques et d’enregistrements. Si les cent et quelques cantates de Buxtehude demeurent en grande partie quasiment inconnues, la musique de chambre et les œuvres pour clavier commencent enfin à être plus largement diffusées depuis quelque temps ; une édition moderne des sonates opus 1 et 2 est en fait disponible depuis de nombreuses années (Denkmäler deutscher Tonkunst, 1903, remplacé par la suite par le volume XIV de l’édition intégrale, 1994). Si l’on ignore les date et lieu de naissance de Buxtehude, on sait en revanche que son père Johannes était organiste de la St Maria Kyrka d’Helsingborg (Danemark) en 1641, et c’est probablement là qu’il vint au monde vers 1637. Il succéda à son père vers le milieu des années 1650 puis fut successivement organiste à Elseneur (1660) et à Lübeck (1668). Ce dernier poste, à la Marienkirche, avait jusque-là été occupé par l’éminent Franz Tunder. Buxtehude n’était pas le candidat favori pour ce poste important, et il épousa la fille de son prédécesseur, Anna Margarethe, une dizaine de jours après sa nomination ; c’était de toute évidence une des obligations du postulant, obligation qui persista puisque Haendel et Mattheson refusèrent le poste – et la main de la fille de Buxtehude, âgée de 28 ans – lorsqu’ils rendirent visite au compositeur à Lübeck en 1703. C’est finalement son assistant (et gendre posthume) Johann Christian Schieferdecker qui lui succéda après sa mort, en 1707. Buxtehude jouissait d’une grande estime à son époque, comptant parmi ses amis, élèves ou admirateurs Reincken, Theile, Bruhns et Pachelbel. Buxtehude est cité dans la nécrologie de Bach comme l’un de ses modèles pour le jeu de l’orgue, et l’influence de son aîné se fait souvent sentir dans les premières œuvres du Saxon pour cet instrument. Les vingt et une œuvres de musique de chambre de Buxtehude se divisent exactement en trois groupes de sept : un premier volume de sonates opus 1 (vers 1694), un second volume opus 2 (1696), les sonates restantes n’existant qu’à l’état de manuscrit, essentiellement dans le recueil Düben désormais conservé à l’Université d’Uppsala (Suède). Un troisième volume, apparemment annoncé en 1684, ne fut jamais publié ou est désormais perdu, et une partie des sonates manuscrites pourrait en avoir fait partie. Les deux volumes publiés sont écrits pour violon, viole de gambe et clavecin, les autres sonates pour un effectif varié. Les œuvres de l’opus 1, les VII Suonate á doi, Violino & Violadagamba, con Cembalo, di Dieterico Buxtehude, Organista della Chiesa della Beat. Virg. N.S. in Lubeca, Opera Prima, furent imprimées à Hambourg par Nicolaus Spiering et dédiées au maire et aux sénateurs de Lübeck ; comme elles sont mentionnées dans les catalogues de la Foire aux livres de 1694, elles venaient sans doute juste d’être publiées. Cependant, certaines de ces pièces au moins pourraient être plus anciennes, et la Sonate en si bémol BuxWV273, qui existe dans un manuscrit des années 1680, a été abondamment remaniée et raccourcie avant d’être publiée comme numéro 4 de l’opus 1. L’instrumentation de ces œuvres pour violon, viole de gambe et clavecin (ce dernier désigné comme tel et non par le terme plus vague de continuo) les rattache à la tradition de musique de chambre de l’Allemagne du Nord. En Italie, les œuvres en trio étaient généralement écrites pour deux violons et continuo, tandis que les compositeurs allemands (Becker, 1674 ; Erlebach, 1694) préféraient souvent le contraste de timbre et de tessiture offert par le violon et la viole de gambe. De plus, le large ambitus de la viole de gambe lui permettait d’intervenir à la fois comme instrument du continuo, doublant ou développant la basse (voir le Lento de BuxWV255), et comme instrument solo à tessiture de ténor. La manière la plus libre et la moins contrainte de composer, chanter et jouer que l’on puisse imaginer […] toutes sortes de progressions par ailleurs inhabituelles, d’ornements cachés, de gruppettos et d’embellissements ingénieux sont introduits sans réel respect de la mesure ou de la tonalité, sans tenir compte de ce qui figure sur la page, sans thème ou ostinato proprement dit, sans thème ou sujet qui soit développé ; c’est tantôt vif, tantôt hésitant, tantôt à une voix, tantôt à plusieurs voix, tantôt à contretemps, sans mesure du son, mais non sans intention de plaire, de bouleverser et de stupéfier. Cité par Kerala J. Snyder, Dietrich Buxtehude: Organist in Lübeck (New York, 1987), p. 250. Cette liberté est ainsi caractéristique de la basse contrainte par laquelle débute la Sonate en si bémol BuxWV255 : le thème lui-même dure trois mesures et demie (longueur inhabituelle), et Buxtehude utilise en outre, au moment où l’on s’y attend le moins, un motif répété de trois notes au violon qui brouille un peu plus encore le schéma d’accentuation des phrases. Par ailleurs, certains passages chromatiques – dans le Largo, de la Sonate en la mineur BuxWV254, par exemple – semblent appartenir à l’univers des Passions plus qu’à celui des sonates de chambre. Ce faisant, Buxtehude entraîne la musique de chambre allemande de son époque sur un terrain nouveau. Les publications de musique de chambre de la fin du xviie siècle groupaient la plupart du temps les œuvres par six ou par douze (tels les recueils de Reincken, Krieger ou Rosenmüller, contemporains de Buxtehude), et le chiffre sept semble avoir eu une signification particulière pour le compositeur (un cycle de sept suites pour le clavier, aujourd’hui perdu, décrivait chacune des planètes alors connues, selon Mattheson). Quoi qu’il en soit, Buxtehude considérait de toute évidence les volumes opus 1 et 2 comme deux parties d’un même ensemble puisqu’à eux deux ils représentent presque toutes les tonalités majeures et mineures de fa, sol, la, si bémol, do, ré et mi, formant une échelle de sept notes, soit l’hexachordum molle plus une note (fa majeur apparaît deux fois, mais fa mineur et si bémol mineur pas du tout, sans doute parce qu’ils n’appartiennent pas au système d’accord alors en usage). De tels recueils, comme ceux de Biber « pour l’autel et pour la cour » (Sonatae tam aris quam aulis servientes, 1676), pouvaient servir aussi bien dans un contexte sacré que profane ; la première version de l’opus 1 no 4 semble ainsi prévue pour l’église puisque la basse est accompagnée de la mention « organo », et non « cembalo ». À cette époque, la classe moyenne de l’Europe du Nord, en expansion et de plus en plus éduquée musicalement, formait parfois des sociétés de musique (comme celle de Matthias Weckmann à Hambourg) qui constituaient un marché tout désigné pour les publications de musique de chambre ; l’écriture violonistique de Buxtehude – qui dépasse une seule fois la troisième position – devait être à la portée de la plupart des amateurs, sauf dans les mouvements exigeant une réelle virtuosité, comme dans la Sonate en ré mineur BuxWV257 (plage 2). (Il n’est pas certain que les opus 1 et 2 se soient bien vendus puisque deux exemplaires complets seulement nous sont parvenus.) Sans doute ces sonates furent-elles aussi inscrites au programme de l’Abendmusik, concerts réguliers donnés par Buxtehude le dimanche après-midi à Lübeck ; certaines d’entre elles furent peut-être écrites à l’intention de Buxtehude lui-même, de Hans Iwe et de Johann Philip Roth, ses collègues de la Marienkirche au début des années 1690, qui jouaient du violon et de la viole de gambe. La première sonate débute d’une manière assez corellienne débouchant sur un dialogue entre voix aiguës et graves. Un Lento en mineur laisse ensuite la place à une de ces fugues en doubles croches ininterrompues si caractéristiques de Buxtehude. Dans l’Adagio et dans l’Andante à 6/8 suivants, la viole de gambe fausse compagnie au clavecin pour donner naissance à une véritable écriture en trio, multipliant les figurations en accords brisés et les entrées à contretemps. Le Presto final reprend le style des deux premiers mouvements rapides, mettant à présent l’accent sur des doubles croches répétées. La sonate en sol majeur fait précéder un Vivace fugué fort enlevé d’une brève introduction Lento ; une nouvelle section lente conduit à un Allegro à 6/8 de caractère italien, opposant cette fois une figuration en accords brisés au violon à une basse chromatique descendante. Après un nouveau répit accordé par un Largo, l’œuvre se conclut par un Arioso à cinq variations dont la figuration rappelle les variations pour clavier de Buxtehude. La troisième sonate donne pour la première fois une tonalité pathétique mineure à ce recueil, avec un long Adagio auquel succèdent une fugue en doubles croches, puis un changement de climat grâce à un Lento en majeur. Un Largo chromatique typique de l’Allemagne du Nord fait le lien entre un Vivace corellien et le Presto final, avec une brève reprise de la section précédente. La sonate en si bémol s’ouvre sur un Vivace animé construit sur une basse contrainte ; le violon domine la section introductive, la viole de gambe ne faisant son entrée qu’à la mesure 18, et les deux instruments s’amusent ensuite pendant quatre-vingt-dix mesures à rivaliser de virtuosité. Suivent un Lento méditatif puis un Allegro digne d’un concerto et se concluant par des doubles cordes au violon. La cinquième sonate, en ut, débute par un mouvement fugué privilégiant une fois encore une figuration en doubles croches répétées. Absente de la section suivante, la viole de gambe revient pour le Largo qui mène à un Allegro proche de la gigue (les nombreux contrastes dynamiques sont précisés par le compositeur), puis à un nouvel Adagio modulant librement et à un long Allegro final. La sonate en ré mineur fait précéder l’Allegro fugué d’un bref Grave ; leur succède une section foisonnante marquée « Con discretione », interrompue par un Adagio de cinq mesures, puis deux mouvements virtuoses rapides, séparés par une section plus lente qui revient pour conclure la sonate. Le mouvement vif final, à 6/8, commencé Poco presto, est ensuite indiqué Poco adagio puis Presto, témoignant de la souplesse de tempo exigée par Buxtehude. La septième sonate est elle aussi en mineur mais ne comporte pas d’introduction lente, débutant par un Allegro fugué dominé (comme toujours) par le violon. Suit un enchaînement de mouvements lents et vifs menant à la gigue prestissimo qui achève cette sonate, et l’opus tout entier. Die Neuentdeckung der Werke des großen dänischen Organisten und Komponisten Dieterich Buxtehude1 erfolgte als Nebenprodukt eines im neunzehnten Jahrhundert erwachenden neuen Interesse an den Werken Bachs. Im Alter von zwanzig Jahren unternahm Bach seine legendäre, mehr als 300 km lange Wanderung nach Lübeck, um dort Buxtehude zu hören und kennen zu lernen, und seine Arbeitgeber in Arnstadt züchtigten ihn, weil er mit dreimonatiger Verspätung zurückkehrte; Wissenschaftler, die Bachs Werke untersuchten und neu herausgaben, vertraten den Standpunkt, dass auch Buxtehudes Musik einer Wiederbelebung wert sei, wenn Bach sie so sehr bewunderte. Monografien von André Pirro (1913) und Carl Stahl (1937) folgten Spittas Edition der Orgelwerke (1875-76). Doch trotzdem musste die übrige Musik des Komponisten bis zu den letzten paar Jahrzehnten auf ein Revival – ob als Neuausgabe, als Forschungsobjekt oder als Tonaufzeichnung – warten. Während viele der über hundert Kantaten nach wie vor fast unbekannt sind, wurde die Kammer- und Klaviermusik endlich in den letzten Jahren in breiteren Kreisen bekannt; die Sonaten Opus 1 und 2 waren in der Tat lange Jahre in einer modernen Edition erhältlich (Denkmäler deutscher Tonkunst, 1903, die später von Band XIV der Gesammelten Ausgabe, 1994, abgelöst wurde). Es gibt keinerlei schriftliche Belege für Buxtehudes Geburtsdatum und Geburtsort, aber bekannt ist, dass sein Vater Johannes im Jahr 1641 Organist an der St. Maria Kyrka in Helsinborg/Dänemark war, und Dieterich wurde dort wahrscheinlich um 1637 geboren. Zur Mitte der 1650er Jahre hatte der Sohn bereits die Nachfolge seines Vaters in seinem Posten als Organist angetreten, und der junge Dieterich übernahm dann nacheinander Organistenstellen in Elsinore (1660) und Lübeck (1668). Diese letztere Stellung hatte der berühmte Franz Tunder innegehabt, und Buxtehude war nicht der zuerst für diese wichtige Stellung ausgewählte Kandidat. Ungefähr zehn Tage nach seiner Ernennung heiratete er Anna Margarethe, die Tochter seines Vorgängers (offensichtlich war dies eine Voraussetzung für die Organistenrolle, und diese Bedingung bestand auch weiter: sowohl Händel als auch Mattheson lehnten den Posten an der Marienkirche – und die Hand Buxtehudes 28jähriger Tochter – ab, als sie Lübeck 1703 besuchten, um den Komponisten kennen zu lernen). Buxtehude starb im Jahr 1707, und sein Assistent (und posthumer Schwiegersohn) Johann Christian Schieferdecker trat seine Nachfolge an. Buxtehude genoss während seiner Amtszeit einen ausgezeichneten Ruf, und zum Kreis seiner Freunde, Schüler und Bewunderer gehören Reincken, Theile, Bruhns und Pachelbel. Bach erwähnt in seinem Nachruf, dass Buxtehude eines seiner Vorbilder beim Orgelspiel war, und in Bachs frühen Orgelwerken ist der Einfluss des älteren Mannes oft zu spüren. Buxtehudes einundzwanzig noch vorhandene Kammermusik-Werke lassen sich gut in drei Gruppen von jeweils sieben Werken aufteilen: Die Sonatenreihe Op. 1 (ca. 1694), eine weitere Reihe Op. 2 (1696) sowie andere, die lediglich in Manuskriptform gefunden wurden, darunter allem die jetzt in der Universität von Uppsala in Schweden befindliche Düben-Sammlung. Eine weitere Sammlung wurde anscheinend im Jahr 1684 angekündigt, aber wurde entweder nie veröffentlicht oder ging verloren – einige der in Manuskriptform vorhandenen Sonaten mögen Restbestände dieser Sammlung sein. Die beiden veröffentlichten Sonatenreihen wurden für Violine, Viola da Gamba und Cembalo gesetzt, während die restlichen für verschiedenerlei Instrumente sind. Die Werke Op. 1, VII Suonate à doi, Violono & Violadagamba, con Cembalo, di Dieterico Buxtehude, Organista della Chiesa della Beat. Virg. N.S. in Lubeca, Opera Prima, wurden durch Nicolaus Spiering in Hamburg gedruckt und sind dem Bürgermeister und Senat von Lübeck gewidmet; da dieses Opus in den Katalogen der Buchmesse von 1694 aufgelistet ist, erlebte es höchstwahrscheinlich zu jener Zeit seine Erstveröffentlichung. Es mögen jedoch manche zumindest dieser Werke älter sein, und die Sonate in B, Bux WV273, die in einem aus den 1680er Jahren stammenden Manuskript existiert, wurde umfassend umgearbeitet und gekürzt, um als Op. 1 Nr. 4 zu erscheinen. Der Satz dieser Werke für Violine, Viola da Gamba und Cembalo (das letztere wird als solches bezeichnet, und nicht etwa durch den vageren Begriff continuo) kennzeichnet diese Werke als zur norddeutschen Kammermusiktradition gehörig. In Italien waren zwei Violinen und Generalbass die Norm für Triokomposition, aber deutsche Komponisten (Becker 1674, Erlebach 1694) zogen oft den durch Violine und Viola da Gamba erbrachten Kontrast von Klangfarbe und der Klangskala vor. Außerdem befähigte der breite Tonumfang der Gambe sie dazu, nicht nur als Generalbassinstrument, das den Bass duplierte oder weiter ausarbeitete (siehe das Lento der Sonate Bux WV255), sondern auch als im Tenorbereich spielendes Soloinstrument zu fungieren. Die freieste und uneingeschränkteste Art des Komponierens, Gesanges und Spiels, die man sich nur vorstellen kann … alle Arten sonst ungewöhnlicher Progressionen, versteckter Ornamente, genialer Wendungen und Ausschmückungen werden ohne tatsächliche Beachtung des Metrums oder der Tonart hervorgebracht, ohne Rücksicht auf das, was auf der Seite steht, ohne ein formelles Thema oder Ostinato, ohne ausgeführtes Thema oder ausgeführten Gegenstand; bald rasch, bald zögernd, bald einstimmig, bald vielstimmig, bald eine Zeitlang hinter dem Takt, ohne Klangmaß, aber nicht ohne den Wunsch, zu erfreuen, zu überwältigen und zu erstaunen. Zitiert in Kerala J. Snyder: Dietrich Buxtehude: Oganist in Lübeck (New York, 1987), S. 250. Der die Sonate in B, Bux WV255 eröffnende Grundbass liefert ein Beispiel für diese Freiheit; das Thema selbst ist (ungewöhnlicherweise) dreieinhalb Takte lang, und Buxtehude setzt an unerwarteten Stellen eine wiederholt von der Violine gespielte Drei-Noten-Figur ein, um das Betonungsmuster der einzelnen Phrasen noch stärker durcheinander zu bringen. Und fallende, chromatische Passagen, wie sie im der a-moll-Sonate BuxWV254, einem Largo, zu hören sind, scheinen eher zur Welt der Passionssätze als zur Kammersonate zu gehören. Buxtehude führt hier die zeitgenössische deutsche Kammermusik auf ein völlig neues Terrain. Die überwiegende Mehrheit der Kammermusik-Publikationen des späten siebzehnten Jahrhunderts ordnen Werke in Sechser- oder Zwölfergruppen an (dies ist z. B. der Fall in Musiksammlungen von Buxtehudes Zeitgenossen Reincken, Krieger und Rosenmüller), und es scheint, als habe die Nummer Sieben eine besondere Bedeutung für den Komponisten gehabt (ein verlorengegangener Zyklus von sieben Suiten für Tasteninstrumente schilderte laut Matheson jeden der damals bekannten Planeten). Aber, wie dem auch sei – Buxtehude betrachtete die Sonatenreihen Opus 1 und 2 offensichtlich als zwei Teile eines größeren Ganzen, da sie insgesamt Werke in fast allen Dur- und Molltonarten von F, G, A, B, C, D und E enthalten – einer aus sieben Noten bestehende Tonleiter, dem hexachordum molle, sowie einem zusätzlichen Ton (F-Dur tritt dabei zweimal auf, aber f-moll und b-moll überhaupt nicht, da sie wahrscheinlich außerhalb des damals verwendeten Systems der Instrumentenstimmung liegen). Solche Sonatenreihen konnten, wie die von Biber ‚für den Altar wie für den Hof’ bestimmten (Sonatae tam aris quam aulis servientes, 1676) sowohl im religiösen als auch im weltlichen Kontext verwendet werden; die Frühfassung des Op. 1 Nr. 4 markiert den Bass in der Tat als ‚organo‘ und nicht als ‚cembalo‘, was auf Verwendung in der Kirche schließen lässt. In Nordeuropa gründete der sich ausdehnende und zunehmende musikalische Bildung genießende Mittelstand manchmal Musikgesellschaften (wie z. B. die von Matthias Weckmann in Hamburg), und Veröffentlichungen von Kammermusikwerken fanden dort gewöhnlich einen aufnahmebereiten Markt; Buxtehudes Einsatz der Violine, die nur einmal die dritte Position übersteigt, war für viele Amateure erreichbar - außer in jenen Momenten, in denen echte Virtuosität verlangt wird, wie z. B. in der d-moll-Sonate Bux WV257 (ob die Veröffentlichungen des Opus 1 und 2 einen guten Absatz fanden, ist fraglich, da heute nur zwei komplette Exemplare erhalten sind). Es mag sein, dass sie auch im Rahmen von Buxtehudes Abendmusik (regelmäßig in Lübeck abgehaltener Sonntagnachmittagskonzerte) erklangen; Hans Iwe und Johann Philip Roth, seine Kollegen an der Marienkirche zu Beginn der 1690er Jahre, spielten Violine und Gambe. Und manche dieser Sonaten mögen zum gemeinsamen Musizieren von Iwe, Roth und Buxtehude verfasst wurden sein. Die erste Sonate beginnt mit einer an Corelli erinnernden Geste, die sich zu einem Dialog zwischen den hohen und tiefen Stimmen entfaltet. Ein Lento in Moll führt dann zu einer jener Fugen in fortlaufenden Sechzehntelnoten, die für Buxtehude so charakteristisch sind (track 2). Im dann folgenden Adagio und Andante im 6/8-Takt löst sich die Viola da Gamba vom Cembalo, um eine wahre Triostruktur hervorzubringen, die zahlreiche Figurationen in gebrochenen Akkorden und Einsätze im unbetonten Taktteil aufweist. Ein abschließendes Presto folgt dem Stil der beiden schnellen Sätze, aber jetzt liegt die Betonung auf wiederholten Sechzehntelnoten. In der Sonate in G-Dur bildet eine kurze Lento-Einleitung den Auftakt zu einem ein lebhaften, fugenartigen Vivace; ein weiterer langsamer Satz führt zu einem italienisch anmutenden Allegro im 6/8-Takt, bei dem diesmal Violinenfiguration mit gebrochenen Akkorden mit einer absteigenden chromatischen Basslinie in Kontrast gesetzt wird. Nach einer weiteren langen Largo-Atempause folgt ein Arioso mit fünf Variationen, dessen Figuration an Buxtehudes Klaviervariationen erinnert. Die dritte Sonate führt das Pathos einer neuen Molltonart in die Sonatenreihe ein, wobei eine Fuge in Sechzehntelnoten auf ein ausgedehntes Adagio folgt und dann ein Stimmungswechsel zu einem Lento in Dur eintritt. Ein Vivace im Stil von Corelli wird durch ein auf charakteristische Weise norddeutsch klingendes, chromatisches Largo mit einem abschließenden Presto verbunden, bei dem eine kurze Reprise des vorigen Abschnitts erfolgt. Die Sonate in B beginnt mit einem lebhaften, über einem Grundbass aufgebauten Vivace; die Violine beherrscht den Eröffnungsteil, die Gambe hat ihren Einsatz erst in Takt 18, und während der nächsten 90 Takte folgt ein verspielt virtuoser Dialog. Dieser geht dann in ein besinnliches Lento und danach in ein konzertantes Allegro über, das mit einem Doppelgriff im Violinenpart zum Abschluss gebracht wird. Die fünfte Sonate in C beginnt mit einem fugalen Satz, der erneut die Betonung auf eine Figuration mit Sechzehntelnoten-Wiederholungen legt. Der dann folgende Abschnitt verzichtet auf die Viola da Gamba, die dann im Largo wieder hinzukommt. Und dies führt zu einem gigue-ähnlichen Allegro, (bei dem die zahlreichen dynamischen Kontraste durch den Komponisten angegeben werden), zu einem weiteren fein modulierenden Adagio und einem abschließenden, ausgedehnten Allegro. Bei der Sonate in d-moll geht ein kurzes Grave einem fugalen Allegro vorauf; dies führt zu einem geschäftigen Abschnitt mit der Markierung ‚Con discretione‘, der durch ein fünftaktiges Adagio unterbrochen wird. Darauf folgen zwei virtuos gespielte schnelle Sätze, die jeweils durch einen langsameren Abschnitt getrennt werden, der dann zum Schluss der Sonate wiederkehrt. Der Schlusssatz im 6/8-Takt beginnt Poco presto und ist dann mit Poco adagio und Presto gekennzeichnet, was auf die von Buxtehude erwartete Flexibilität des Tempos hindeutet. Die siebte Sonate ist ebenfalls ein Werk in Moll; diesmal gibt es keine langsame Einleitung, sondern einfach ein fugenartiges Allegro, bei dem (wie immer) die Violine die Führung hat. Eine Sequenz langsamer und schneller Sätze folgt, und die Sonate – sowie das gesamte Opus – werden durch eine prestissimo gespielte Gigue vollendet.